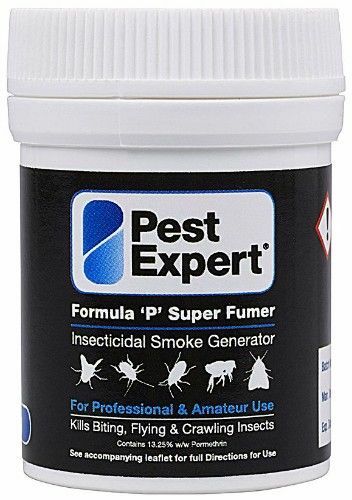 The Pest Expert Formula ‘P’ Super Fumer Cluster Fly Smoke Bomb is a powerful fumigation device, treating three times the area of a standard 3.5g smoke bomb. The Super Fumers combine modern science in the formulation of their potent active, permethrin, with the tried-and-tested traditional delivery mechanism of a smoke bomb. 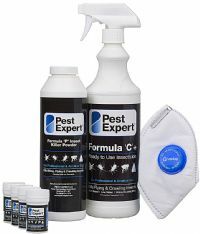 The Formula ‘P’ Super Fumer offers rapid extermination of all cluster flies present at time of treatment. Through releasing an insecticidal smoke the fumer is able to work into all the cracks and crevices where cluster flies are harbouring. Once lit the fumer will smoulder to release its insecticidal permethrin smoke, which leaves no visible deposits and will not damage any interior furnishings or stored goods both during and after use. Use as and when you notice cluster fly activity and apply at a rate of one smoke bomb per room or a 400 cubic metre area. For standard size lofts (3-bed house), use one twinpack of smoke bombs. 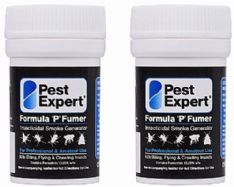 Formula 'P' Super Fumers should ideally be used with Pest Expert Formula 'C' Cluster Fly Spray or Formula ‘P’ Cluster Fly Powder to maintain longer-term cluster fly control as the smoke has no residual effect once dispersed. Please also see our complete Cluster Fly Treatment Packs which contain Cluster Fly Spray, Smoke Bombs and Cluster Fly Powder along with a Safety Mask and Gloves and comprehensive cluster fly treatment instructions.